Behind the heart wrenching scenes of animal brutality from China’s annual Yulin festival, there was one quiet hero who travelled nearly 2 500 kilometres to save as many dogs as she could. Behind the heart wrenching scenes of animal brutality from China’s annual Yulin festival, there was one quiet hero who travelled nearly 2 500 kilometres to save as many dogs as she could. 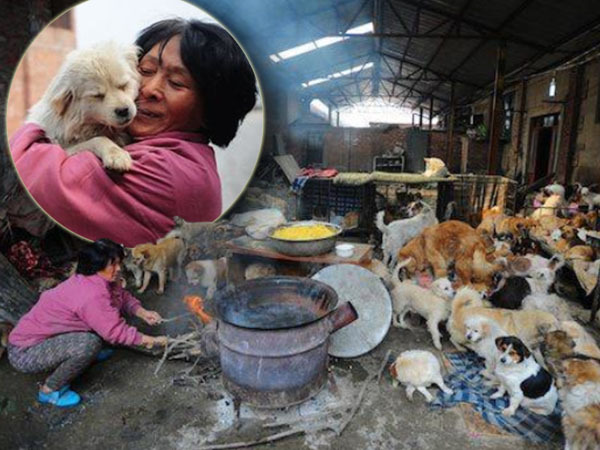 Heroic Yang Xiaoyun sold off her homes to fund a rescue operation which has saved an estimated ‘thousands’ of cats and dogs. It is estimated that around 10 000 cats and dogs are slaughtered during China’s annual Yulin festival which marks the summer solstice. The festival featured scenes of horrific brutality to animals and protesters claim that slaughterhouse workers and vendors torture dogs by beating them with hammers, stringing them up by their necks and even blowtorching them alive. The international outcry has been massive with celebrities like Leona Lewis and Ricky Gervais leading calls for the festival to be banned. Meanwhile Yang Xiaoyun, a 65-year-old retiree, travelled 2 500 km from her home in Tianjin to Yulin city where the festival is held. She owns an animal sanctuary called Common Home for All and claims that she first began rescuing animals in 1995 when she pulled an abandoned kitten from a river. But her charitable works have come at a high cost and after her husband passed in 1995, selling the family homes didn't go down well with her only son. He was infuriated that his inheritance was being flushed down the drain. Her neighbors also complain endlessly about the stench and the dogs barking all night, but Yang is undeterred.